Portugal midfielder Ruben Amorim, who was flown in to replace injured winger Nani in their World Cup squad, will be out of action for at least six days after damaging his left thigh in training. Australia captain Lucas Neill has vented his fury at sections of the media that have suggested his team of being whingers. "Everything that's been written in the last couple of days is the fact that we're all of a sudden a team of whingers," said Neill. "I think it's everybody else who's doing the whinging. "Australia have never been a team that whinges, we don't want to be regarded as a team that whinges. "Did we whinge when we were down to 10 men (against Ghana)? We took it on the chin, stood up and in the end probably could have won the game. That's not a team that whinges. "A team that whinges is a team that would have lost 3-1 or 4-1 and then come in and complained to the referee." Portugal midfielder Ronaldo handed his man-of-the-match award won following his side's 7-0 thumping of North Korea to team-mate Tiago. Tiago scored two goals in the drubbing. "I gave the man of the match prize to Tiago because he played better and it was only fair to give the trophy to him," he said, having ended his two-year scoring drought for Portugal during that match. Kaka said he "did not want to repeat" what his 70-year-old grandmother said about the referee who sent him off in Brazil's win over Ivory Coast. "She was happy with the way I played, but sad with the sending off. With all the respect that she has, she launched a bit of a tirade at the referee," the Brazil playmaker said. Spain's Euro 2008-winning boss Luis Aragones believes the current side will "not go very far" at the World Cup unless they improve their performances. The Spanish recorded a 2-0 win against Honduras to keep their World Cup hopes alive going into the final game. "Playing like this. Spain cannot go very far," he said. "We are not going in the right direction and we must improve for the match with Chile. 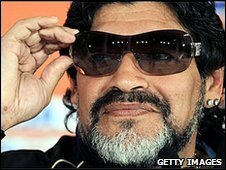 Argentina coach Diego Maradona has said that Brazil are his favourites to win the World Cup while downplaying his side's hopes of winning a third title. Impressive wins against Nigeria and South Korea mean Argentina need only one point from their final group game against Greece on Tuesday to reach the last 16 but Maradona is refusing to get carried away. "I don't want to be favourites, not before coming to South Africa and not now," he said. "We're here to keep our fans happy, to play the way we want to play, and I think things so far are going well. "Brazil can play badly but still win games, that's why they are still the great favourites." North Korea television was quick to gloss over their side's humiliating 7-0 defeat by Portugal on Monday that eliminated them from the World Cup. Billed as a revenge match against the side that knocked them out of the 1966 World Cup at the quarter-final stage, it was the first game to be aired live in a communist country that exerts strict control over media coverage. However, hopes of avenging the 5-3 defeat from 44 years ago, in North Korea's only other trip to the World Cup, were extinguished by six second-half Portuguese goals. "The Portuguese won the game and now have four points. We are ending our live broadcast now," a Korean Central Broadcasting commentator said, quickly cutting to footage of factory workers and engineers praising North Korean leader Kim Jong Il. West Ham midfielder Valon Behrami is hoping his Switzerland team-mates can keep his World Cup dream alive following his sending off in Tuesday's 1-0 defeat by Chile. The 25-year-old will miss Friday's final Group H game against Honduras as the Swiss attempt to make the most of their opening 1-0 win over Spain to book their place in the last 16. The group is extremely tight but if Switzerland beat Honduras by more than one clear goal it will guarantee their progress. Italy striker Alberto Gilardino has told his team-mates to improve against Slovakia or they will "deserve to go home" from the World Cup. The Azzurri head into their final Group F match at Ellis Park on Thursday searching for their first win of the tournament after being held to draws by Paraguay and New Zealand. "I didn't expect it to turn out like it did," said Gilardino, who has yet to score in the tournament. "But if we want to progress to the next round, we have to do much more, otherwise it is right that we go home." 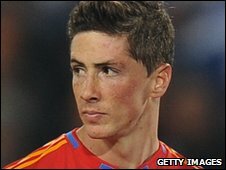 Spain striker Fernando Torres is the latest player to complain about the World Cup ball. The Liverpool player, who is returning to match sharpness following knee surgery, missed a host of chances in his country's 2-0 victory over Honduras in Group H on Monday. "Personally speaking, I am very happy to have played but we need to practice a bit more with this Jabulani because we are having a bit of bother with it," said Torres. Spain's win got their World Cup campaign back on track after their opening 1-0 defeat to Switzerland, and victory over Chile in their final group game will ensure them a place in the last 16. Fifa has confirmed that South Africa's appeal against goalkeeper Itumeleng Khune's red card against Uruguay had been rejected, meaning he will be suspended for Tuesday's final Group A match against France. A Chinese factory making vuvuzelas is having to increase production to keep up with huge demand during the World Cup. Chinese manufacturers say almost 90% of the vuvuzelas used in South Africa are made in China. "With regards to the production volume, from January to April this year, we were producing 250,000 vuvuzelas every day to fill containers that are exported from Ningbo port," said Yijun Wu from the Ninghai Jiying plastics factory. "We were making 10,000 vuvuzelas a day for the past few days and I estimate we will make 25,000 per day in the next few days. "The demand from the Chinese market alone is surpassing our production capability." Netherlands coach Bert van Marwijk says his players "do not have to be friends" but they must respect each other. While the Dutch camp appears unified - a testimony to which is victory over Denmark and Japan in their first two matches of the World Cup - this has not always been the case, with previous major tournaments disrupted by disharmony in their squad. "It is just as important to have a strong team, a team that knows what it is about and does not necessarily have to be each other's friends," said Van Marwijk. "They have to respect each other's qualities. They need to be able to tell each other the truth. "Those are usually the teams that are able to bounce back when it really matters, and I think that we are able to do that." Portugal midfielder Deco will have a scan on a hip injury on Tuesday. The 32-year-old Chelsea player aggravated the problem in training following his country's 0-0 draw with Ivory Coast last week. He sat out Monday's 7-0 win over North Korea and could miss the clash with Brazil on Friday which will decide who tops Group G.
North Korea coach Kim Jong-Hun is pondering a change of tactics for their final Group G match against Ivory Coast on Friday as they attempt to salvage some pride following Monday's 7-0 mauling by Portugal. The Asian side have already been eliminated from the tournament following two defeats, but would rather depart off the back of another spirited display like the one they produced in their 2-1 opening game loss to Brazil as opposed to repeating their meek performance against the Portuguese. "As a coach I think it was my fault for not planning the right strategy," said Kim Jong-Hun, who deviated from a 5-1-3-1 formation against Brazil to 4-3-3 for the Portugal match. "In the final match against Ivory Coast we will have to think over our tactics," he added.